Baby massage has been proven to help relax your baby and help them sleep. Use this homemade baby lotion at night to help send your little one off to dreamland. 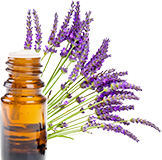 Benefits: Lavender and chamomile are both soothing and calming and will help your baby to sleep. Cocoa butter and coconut oil are safe to use on your baby and will leave the skin moisturized. Tips and Tricks: You can give your baby an extra dose of relaxation by checking out some infant massage books and classes! Variations: For a baby under 6 months, it’s best to leave out the essential oil. Watch the video below for a step-by-step tutorial for making this DIY homemade baby lotion recipe. Use a double boiler, or make one by adding water to your pot and placing a metal bowl over pot. Add cocoa butter and coconut oil and melt over medium/low heat. Remove from heat and add in essential oils, stirring to combine. Using a rubber spatula, scrape the mixture into a bowl and allow to fully cool. Once solidiﬁed, beat the lotion using a stand mixer or handheld mixer until the lotion becomes a whipped, ﬂuffy texture.